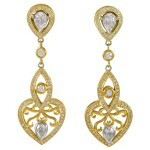 Beautiful pear shape and round brilliant cut diamond dangle earrings set in 18k yellow gold. The diamonds are E-F color, VS clarity, and have a total weight of 1.21cts. The earring back is a simple post.